Make dinner YOUR way with this simple and easy homemade pizza dough ready in just a few minutes and topped with a combination of melted cheese and herbs. 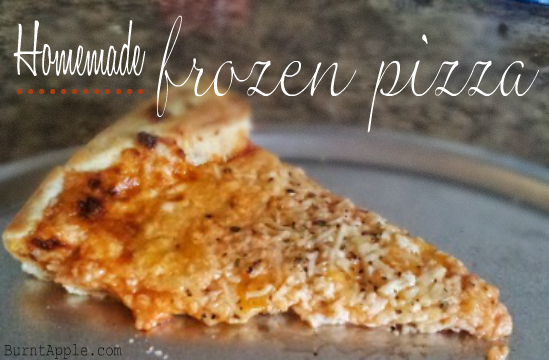 Homemade frozen pizza has never tasted better! Our family loves pizza. I’m not kidding–we love pizza. Now that our family is growing, buying frozen pizza from the store is getting more and more expensive. Because we can’t just buy one now. And when you are buying higher quality frozen pizza–seriously can you believe how much a frozen pizza costs? Dinner easily becomes $15-20, and on a tight budget that can be hard to swallow just for one meal. I’ve started opting to make our own homemade pizzas. I like it because I can make it my way and always know that it’s going to be a healthy pizza recipe. It’s also easy because I make them up and then freeze them for a later night. Woila! A healthy homemade frozen dinner that I just pop in the oven on busy nights. Your supply list for making these is easy. All you need are two 12″ round pizza pans (you can find them for $1 a piece at dollar stores). If you need to double the recipe, buy more! You also need heavy duty freezer tin foil, plastic wrap, or you can splurge and buy this Tupperware 12″ round plastic container that will store your pizzas nicely. I haven’t been able to find a more eco friendly option for storing, so if you have suggestions, please tell! You can even opt to make a gluten free pizza. This recipe for The Best Gluten Free Pizza Dough by The Minimalist Baker is incredible! Just make up the dough and then follow our frozen pizza instructions to make it into a frozen pizza. 5 cups bread flour (I've used white whole wheat flour and unbleached all purpose flour in the past and both work great). In a mixer with the dough hook attached, place the yeast, sugar and warm water. Stir just until combined, then allow mixture to sit for approximately five minutes. Turn the mixer to low and slowly add in the flour, oil and salt, mixing until dough becomes smooth and forms a ball. (Note, if you are using white whole wheat flour you may need to add additional water to the mixture--add water one teaspoon at a time). Turn off mixer and allow dough to sit for approximately five minutes. Remove dough from mixer, and split the dough evenly into two equal portions. Form the dough into a ball and with a rolling pin roll dough to slightly larger than the pizza pan. Sprinkle a light layer of cornmeal on the pizza pan, than place the dough on the pizza pan. Roll edges inward to form the pizza crust. Place pizza dough in the oven and bake for approximately 3-4 minutes. Remove from oven, allow crust to cool before topping pizza. After placing desired toppings on pizza (see notes for variations) wrap pizza completely in heavy duty aluminum foil and then plastic wrap. Label and place in freezer. To cook: preheat oven to 400 degrees. Unwrap pizza completely, then place in oven. Bake for 16-20 minutes or until cheese is bubbly and crust is lightly browned. Remove from oven, cut and serve. *For Cheese Pizza: Pour 1/2 cup marinara sauce onto pizza crust. Spread evenly over the crust with a spoon. Top with a combination of parmesan romano, mozzarella and cheddar cheeses. Top with a sprinkling of Italian seasoning or parsley. *For Barbeque Pizza: Pour 1/2 cup barbeque sauce on the pizza and spread evenly with a spoon. Top with shredded chicken, jalapenos or red onions, chopped bacon and mozzarella cheese. *For Veggie Pizza: In a bowl, mix together 1/2 cup sour cream, 1/2 cup cream cheese, dill weed to taste and 1-2 tablespoons ranch seasoning mix (we use Simply Organic). Stir together and pour and spread over pizza crust. Top with desired sliced vegetables and a light layer of mozzarella cheese. (Instead of the creamy mixture you can opt to use pesto for the spread instead. Drizzle a little balsamic vinegar over the grilled vegetables before putting on the mozzarella cheese. *Instructions for toppings are for one pizza. If you are making two of the same pizzas you will need to double the amount used. shared & pinned – thanks for linking with Kids in the Kitchen! I’m going to try making my pizza dough this way sometime. Thanks for the recipe and freezer tips! I’ve frozen pizza dough before, and it’s turned out fine. I just haven’t frozen a whole pizza. Thanks for linking up at Romance on a dime!! Thanks for mentioning our recipe! Glad you enjoyed them!